God is BIG and He does BIG things! 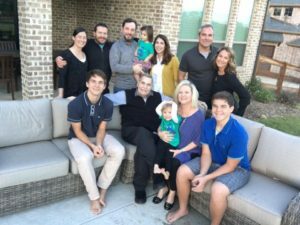 After a long and valiant fight with cancer, Steve Seelig stepped out of pain and into the presence of his Lord and Savior. Many of you followed Steve’s journey through his regular blog posts and witnessed first-hand his courage, faith and tenacity. Never afraid to walk through doors that were opened for him, Steve changed the lives of those around him. Through these opportunities, Steve transformed into a leader and a visionary. Shearer Hills Baptist Church in San Antonio gave him the grace to develop as a young minister. At Second Baptist Church in Little Rock, he “pushed the envelope” and appreciated the wealth of diversity in the church. During his time at Willow Meadows Baptist Church in Houston, he recognized the importance of international missions and loving those outside our borders. North Phoenix Baptist Church allowed him to see the beauty of growth through evangelism and a staff that feels like family. Serving at Houston’s First Baptist Church, the opportunities were endless. METRO Bible Study allowed Steve to reach young adults and unite a city. Steve also learned the importance of Women’s Ministry as a spearhead of Beth Moore’s Living Proof Ministries. Music was a part of every aspect of his ministry. Steve saw a new form of worship inspiring an emerging generation leading him to aid in the development of Passion Conferences with Louie Giglio. Steve produced, nurtured, and managed Christian artists and speakers such as Point of Grace, Jaci Velasquez, Watermark, Jami Smith, Vodie Baucham, and Passion Worship. Under the leadership of Dr. Ed Young at Second Baptist Church, Steve used his gifts to the fullest. Combining all these experiences and believing that children are the heart of the church, Steve developed a children’s program unlike any other and became Papa Steve to so many! Steve’s love of people and bringing the JOY of Christ to others was woven through all opportunities in his life. Steve chose to brag about his children and family more than his accomplishments and successes. He loved watching his grandsons play sports and facetime with his granddaughter, always making her laugh. Steve taught his family to love and live life to the fullest! He leaves behind his wife of 46 years, Bonita, his 92-year old father, Dr. John Earl Seelig, and his family: Stephanie, Jeffrey, John Mark, Laura, Will, Jake, Bowen, Tim, Dan, Corianna, Clay, Clara, Judson, Julianna, and Eden. 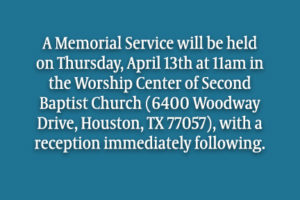 A Memorial Service will be held on Thursday, April 13th at 11 am in the Worship Center of Second Baptist Church (6400 Woodway Drive, Houston, TX 77057) with a reception immediately following. 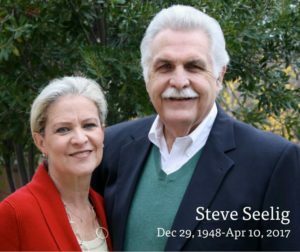 In lieu of customary remembrances, the family requests with gratitude that memorial contributions in Steve Seelig’s name be directed to: Second Kids at Second Baptist Church (6400 Woodway Drive, Houston, TX 77057), MD Anderson Brain and Spine Research (1515 Holcombe Blvd, Houston, TX 77030), or Houston Hospice (1905 Holcombe Blvd, Houston, TX 77030). To see a snippet of the many, many moments in Steve’s life and ministry, be sure to watch the video presentation by clicking on the photo below.